If you're wondering whether to buy flight insurance before your next trip then I have just the app for you. There's a new app in iTunes last month called "Am I Going Down?". Guess what it does. "Am I going down?" 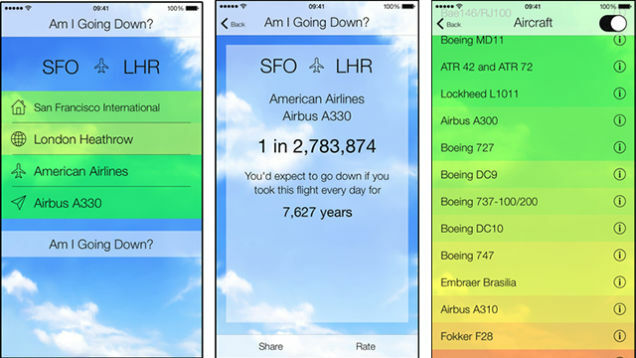 asks you basic questions about your airline, flight number, and aircraft, which is then used to compute the odds that your flight will end badly. The app is designed to put jittery fliers at ease by highlighting the astronomic odds of any particular flight crashing en route. The app was developed by London-based Vanilla Pixel. It uses statistical data, including an aircraft's safety record, weather risks, and the number of years since an airline's last fatal incident (just to name a few) to guesstimate whether you'll survive the trip. A Boeing 777 Cathay Pacific flight from Hong Kong to Los Angeles, for example, has a one in 4,068,434 chance of ending badly. At $0.99, "Am I Going Down?" may seem like little more than a joke, but as a nervous flyer myself I find it reassuring that the odds aren't in my favor. …but as a nervous flyer myself I find it reassuring that the odds aren’t in my favor. Excuse me, I don’t understand. one in 4,068,434 chance of ending badly are not in your favour? Is it ironic? The odds are against the flight going down, so they’re not in my favor. Or should I frame it the other way around.